Above: Dominic alerts Linda to someone knocking at the door or the phone ringing at work. 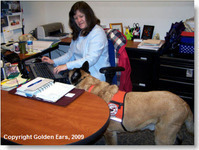 Hearing Dogs that have attained the training needed to work in public, assist their human partners by alerting to a myraid of workplace noises. Telephones, people knocking, people approaching from behind, smoke alarms and other types of alarms are but a few of the noises that dogs might alert to. Many workplace sound alerts are specific to the individual's occupation. An individual who works in an office environment will have different needs than one who works in an environment that is out of doors. The dogs are taught to respond to sounds while they are in the classroom. Many hours of training and practice help them become a team. Below: A young corgi alerts his owner to the phone ringing during class.